When one happens to do a particular action, there will always be risks and benefits. For those who are in charge of handling business-related projects or actions, they must always realize what the potential benefits and risks are. That way, they can make the decision as to whether or not things should push through. you may also see Analysis Templates. This means that they’re going to need all of the information that will tell them all that they need to know in regards to the “good” and “bad” of conducting a particular action. 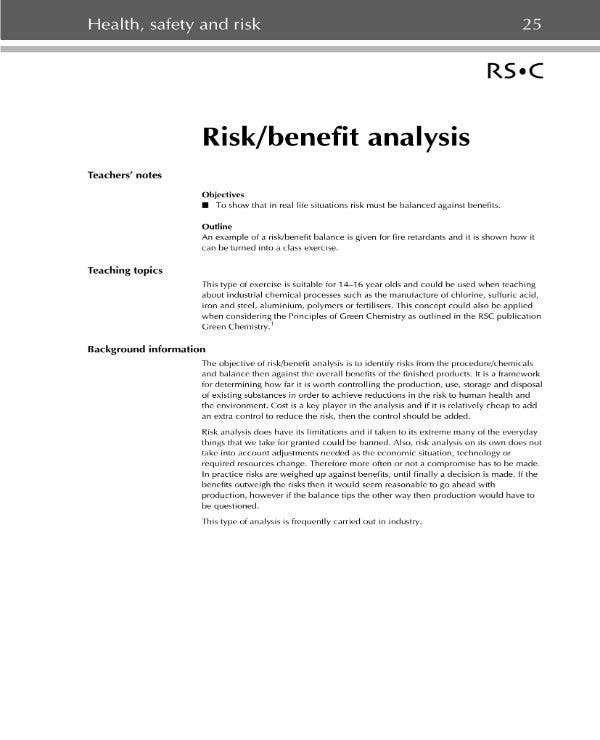 And that’s why this article is going to teach you how to come up with a risk-benefit analysis. 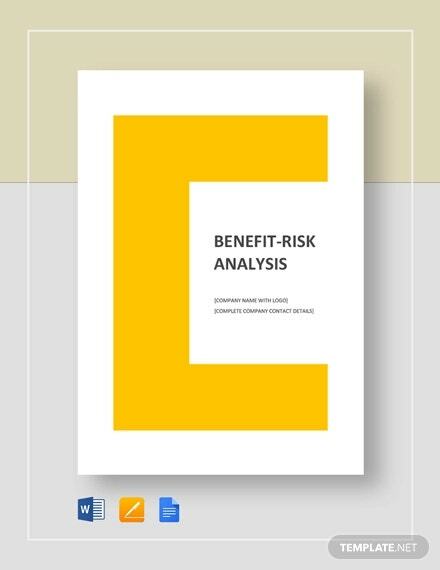 Remember that the point of doing the risk-benefit analysis is because it allows you to understand what you can potentially lose and gain from doing a particular action. This is very important for just about all businesses as they must consider every move they make. Will it help them in the long run? Or is there a chance that it will end up wasting time, effort, and resources? Those questions can only be answered by acquiring the right information. 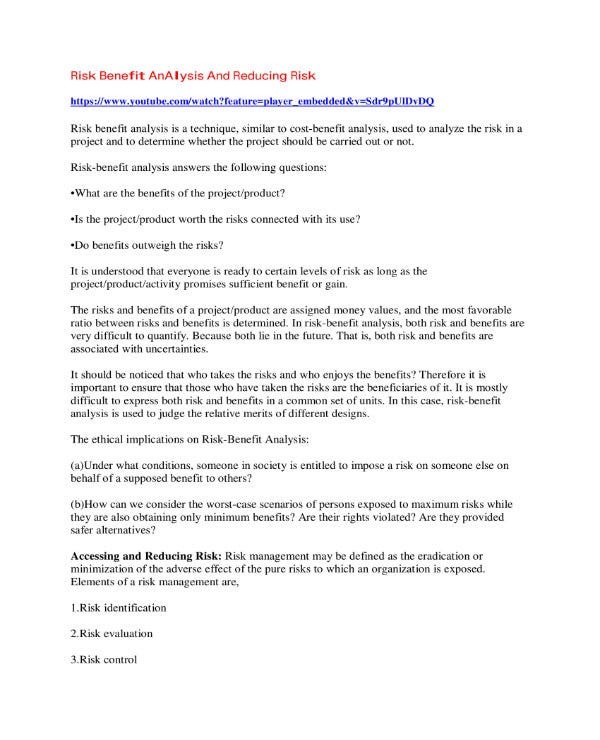 With that being said, here are the steps that will allow you to do a proper risk-benefit analysis. 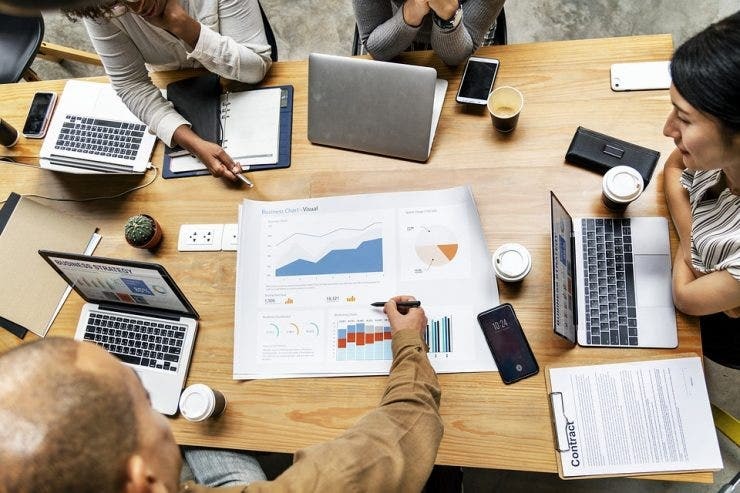 The firs step to take when doing this analysis is for you to come up with a team of people that can help you spot all of the different benefits and risks of the action that you wish for the business to conduct. You’re going to need these people as you want to make sure that you don’t miss out on any possible benefits, as well as spotting all of the causes and possible issues that certain risks may provide. With the right kind of employees to aid you, it’s mostly guaranteed that you’ll get all of the information that you’re going to need. So to start, you need to choose the people that you’re going to want. Out of those that are already under your current staff, you should go for the ones who have the skills, knowledge, and experience necessary to provide you with the help that you need. Just be sure that these people are competent so that you won’t have to worry about gathering information on all of the risks and benefits that will be present during a particular action. Once you have decided on who you want to choose, the next step is to come up with a list where you can write them all down. Be sure that you include their complete names as well as what roles they are required to undertake. Eventually you will be writing about the tasks that they will be assigned as there are still a couple of other steps that you’ll need to learn about before doing so. Take note that the reason as to why you would have to do this is because you need to keep track of what these people are doing. Also, you can ask these people what it is that they’ve managed to gather and check as to how they’re performing with their roles. Once you’ve managed to assemble your team, the next step is for you to understand the action that’s going to be taken by the business and to thoroughly understand it. The only way that you will be able to identify what benefits and risks a particular action is going to have is by learning everything there is to know about it. To start, you must know exactly what it’s going to need. Are there going to be any particular resources that will need to be used? What kind of equipment will the employees be utilizing upon conducting the action? Is there a need to hire additional employees in order to complete the action? Next is that you will have to consider the budget that will be required in order to perform that particular action. How much will each of these resources cost? Will the budget be able to account for everything that the action is going to need? And lastly, you have to think about the amount of time it’s going to take in order to finish whatever it is that’s supposed to be done. How long do you think it’s going to take? Is it going to take too much time from your employees? Do you think everyone will be able to finish it on time? All of the questions above are ones that you’re going to have to answer if you’ll want any idea as to what it risks and benefits an action is going to have when done. Be sure that you write all of them down into the document so that you can analyze everything in an organized and efficient manner. Once you’ve listed down all of the factors that contribute towards the starting and end point of the action, then the next step is to see what kind of benefits the action is going to offer. If a project manages to do anything positive for you, your employees, or the entire business in general, then that should tell you that it’s an important benefit. So think, what good can come out if the project is done? Will it be able to increase your business’s sales? Can it improve the performance of your employees? Will it bring about improvements in the overall quality of the business? While different actions will have different benefits, it’s important that you know what those are. You’re going to need the information as you’ll be using it to make very important decisions. It could mean the difference between doing an action that could be good for the business, and doing one that does nothing or even inflict harm on the business and all of those in it. So be sure that you make full use of the team that you’ve assembled to help you list down all of the benefits. Once you have managed to figure out all of the possible benefits that a particular action is going to bring, then the next step is for you to understand all of the possible risk that will be present if the action were to take place. It’s very important that you know what these risks are as you’ll want to figure out what could prevent the action from being completed or if doing it may harm anyone involved or the entire business in general. This can help make the decision as to whether or not the action should still be conducted. 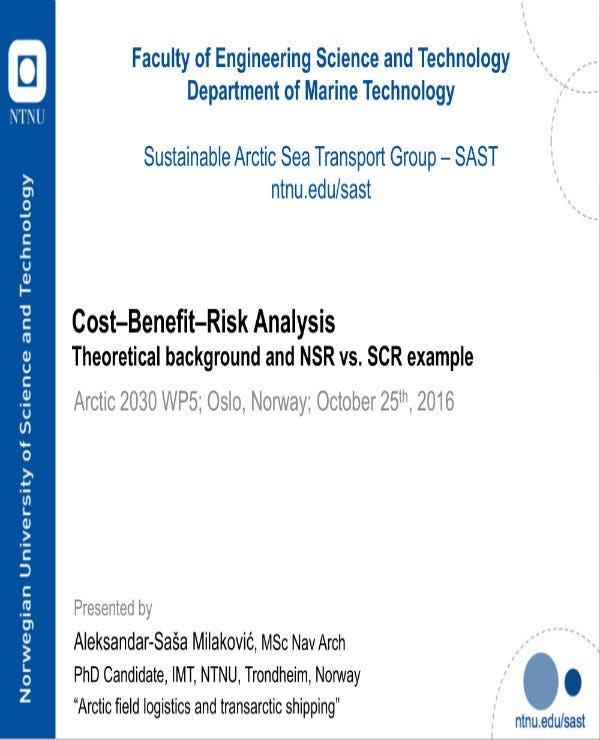 If the risks outweigh the benefits? Then best to reconsider doing something else or come up with ways to lessen the amount of risks. This is where you’ll make the most out of the team you’ve assembled as you want them to help you track down all of the possible risks as well as the factors that can cause them to become a problem. Make sure that everyone is able to cover everything that involves all of the risks that could take place so that you can come up with the means in which you can prevent or possibly even avoid them at all costs. Let’s say that you’ve managed to analyze all of the risks and figured out where they’re all coming from. Now that you know about all of them, then the next step is for you to come up with the ways in which you and everyone else can avoid and/or prevent them from ever causing issues. It’s important that you go into great detail when writing what needs to be done as you want to ensure that everyone does their part to make these risks a non-issue. So to start, point out what procedures will need to be followed to guarantee that no trouble will arise from doing a particular action. Next is that you will need to share what it is that will be needed to ensure that everyone can prevent or avoid these risks. This can be anything from different types of materials to safety equipment which can guarantee that nobody, not even the business itself, is harmed. Although analyzing the risks and benefits of a particular action, especially one done by a business, is going to be difficult, it’s still best that you do so. Just be sure that you follow the steps above and you’ll find that it’s going to be much easier than you anticipated. If you would like to learn how to do other types of analysis, then all you have do is to go through our site. It has many different articles that contains information that should be able to provide you with the help that you need. Just be sure that you read these articles thoroughly so that you can make the most out of whatever these articles have to offer you.